Sometimes you need to get far enough away from the city to feel like you’re no longer in a concrete jungle but still close enough to appreciate the beautiful landmarks and scenic views the city has to offer; Luckily there are several hiking trails that provide just that. This list specifically features trails that offer beautiful views of the city and Pacific Ocean for you to enjoy while allowing your best bud to tag along. Get that camera charged because each trail offers several photo-ops. Remember most of the hikes listed here are geared towards beginners, with a few more moderate length/difficultly ones thrown in for good measure. If you’re looking for more of a challenge, I recommend visiting some of the dog friendly hikes listed over on Modern Hiker. As with any hike make sure you always take enough water for yourself and your dog, and be sure to think through about the fitness level of your pooch too. There’s nothing worse (and dangerous) and your trail companion tapping out from exhaustion midway through. Finally, to be respectful of both the trail and the other dog owners who may be traversing it, please keep your dog ON LEASH unless it’s a specified non-leash area. More heavily brushed trails also a source of fleas or bugs that may be attracted to your dog, so it’s good to check with your vet before beginning a hiking regimen to see if they have any advice on that front. Celebrity magnet Runyon Canyon is one of the most popular hiking spots so it can get a little busy but the views of the Hollywood sign and the L.A. Basin are pretty spectacular. 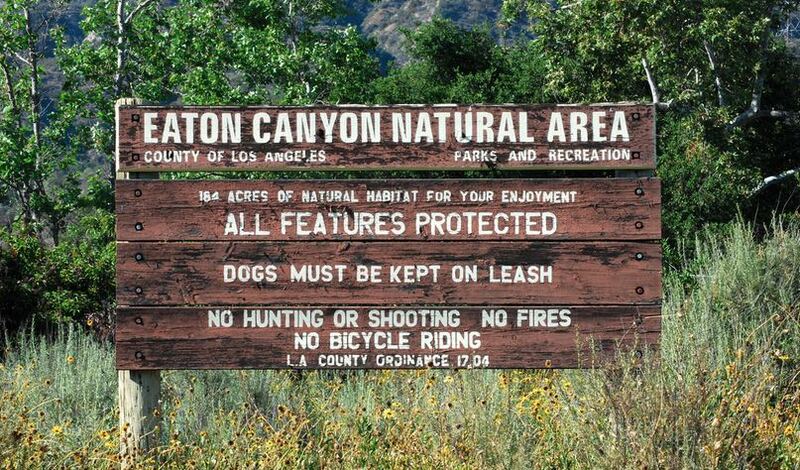 Runyon also has an off-leash area and you can hike the trail with your dog on-leash. If the hotspot isn’t your cup of tea you can visit the adjoining Trebek Open Space. The man who donated the 62-acre land to the Santa Monica Mountains Conservancy… Who is Jeopardy Host Alex Trebek. The hike is almost three miles and is relatively easy and far less populated than Runyon. This is a relatively easy three-mile loop that includes a rock exhbit showcasing the variety of rocks found in the Santa Monica Mountains (a geology-nerd dream) and the TreePeople’s Center for Community Foresty. The tree-planting volunteer group cares for a tree nursery and runoff garden and, of course, great landscaping making this trail both easy and educational. There is a $3 parking fee, cash or coins only. Griffith Park spans 4,310 acres and is the second-largest park in California so hiking options are plentiful. Bronson Canyon is home to the famous Batcave, a 50-foot long tunnel used in the 1960s Batman series,so if you’ve got a Batman harness here’s a chance for your photo-op and if you don’t…well you’re missing out. It’s a six-and-a-half mile hike (round-trip) from Bronson Canyon in Griffith Park with a pretty good view of the Hollywood sign. The trail doesn’t offer much shade, but it’s also very wide (which makes it easy to manage a dog), but space will get a bit tighter once you get to the viewpoint from behind the Sign at the top of Mt. Lee. Also, horses frequently ride on the trail, so watch out for the droppings! It’s OK to go chasing waterfalls at this trail, just make sure you keep your pup’s leash on. The 190-acre oasis located in Pasadena has a roughly three-mile round-trip hike that features a 40-foot waterfall with a small pool at its base. There is also a scenic site in Henniger flats with lots of shade provided by pine trees and a tree nursery with photo opportunities available in the lookout tower. The one-mile Solstice trail is easy and shaded and leads to the ruins of the Keller stone cottage, believed to be the oldest existing stone building in Malibu. The hike also leads to waterfalls and the chimney of a burned-out mansion called Tropical Terrace so despite the ease of the trail you’re bound to spend a lot of time sight seeing. The Rising Sun Trail is another option though it’s steep and has no shade making it the more adventurous option. Either way you and furry bud can enjoy a walk among the ruins and panoramic views of the Pacific Ocean. 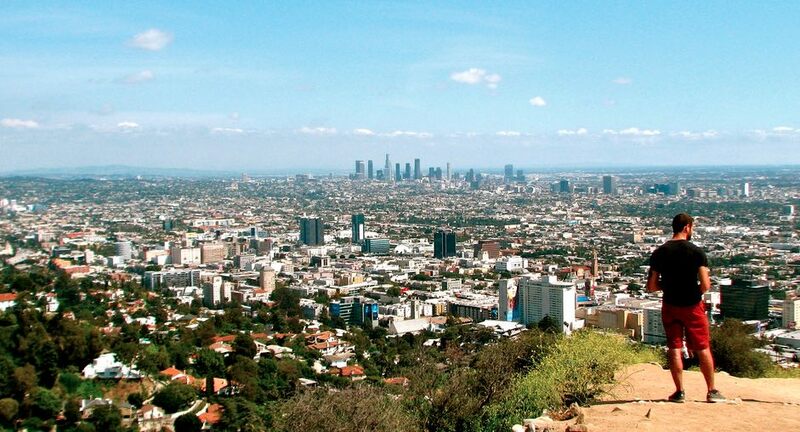 The low-key cousin of Griffith and Runyon, Franklin Canyon spans 605 acres with over five miles of hiking trails. The park has its own claim to fame courtesy of the three-acre Franklin Lake, the fishing hole featured in the opening credits of The Andy Griffith Show (Millennials, feel free to Youtube that). The popular Hastain Trail is a little over two miles round trip with a slight incline that leads to almost a 360° view of L.A. and, on a clear day, the Pacific Ocean. This hike is longer than Eaton Canyon and a little rockier but it features Escondido Falls, the largest waterfall in the Santa Monica Mountains at 150-feet. The trail is a little over four miles long and it’s along PCH so plan ahead to find the best parking spot. The Hollywood Sign is often a star attraction for hiking trails and the path to Cahuenga Peak is no different however it does offer a little relief from the more populated hiking spots as it’s a more rugged path. The three-mile round trip Wonder View trail to the sign includes another relatively famous attraction- the Wisdom Tree. The tree is the lone survivor of the Hollywood Hills fire of 2007 and there’s even a box for passers-by to leave notes (or business cards from those in the industry cause this is L.A. after all). Cahuenga Peak is less than half a mile away from Mount Lee where you’ll get to the back of the famous sign though the trail is a bit more rugged so it’s probably not the best option for a total beginner. Keep in mind that things get a little tight on the ascent up the trail to the tree (it’s basically a one-person track), so it’s really important to be aware of other potential dogs on the trail if your pup is a bit reactive. This is the most challenging hike on the list so it’s perfect for both humans and dogs that can handle a good workout. Once you reach Inspiration Point you’ll get amazing views of the city, the Channel Islands, the Pacific Ocean and even the San Gabriel Mountains on a clear day. The six-mile trail leads to the highest point in the Santa Monica Mountains with an elevation of 3,114 feet – a rewarding accomplishment after the long trek. Need a little more motivation? Casey Schreiner of Modern Hiker recently told us that for his money, Sandstone Peak is “the best hike in Southern California.” ‘Nuff said! This is probably one of the easiest hikes on the list but the views of the ocean are some of the best. The trail is about two miles among the bluffs and you’ll eventually find yourself near the tide pools for an up close look at the local marine life. The hike is easy and you end up at the beach, what more can you ask for? What are your favorite spots to hike with your dog in Los Angeles? Let us know in the comments below!